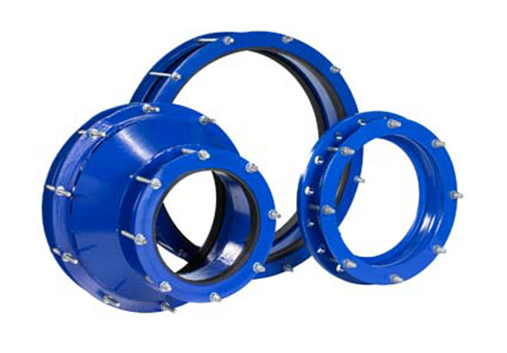 SupaFit Range - flange adaptors, couplings and step/reducing couplings and adaptors. - CASCADE PLC - The new home of Cascade Clamps UK Ltd, Suppliers and Manufacturers of pipe fittings to the water & gas industry. The Cascade SupaFit Range is an extensive product line of Flange Adaptors, Couplings, Step and reducing Couplings, Adaptors. Constructed from Carbon Steel and coated in an anti-rust epoxy with Galvanized nuts and bolts. Suitable for use on Ductile, Cast Iron, Steel, PVC and Asbestos Cement pipes. Sizes from 350mm to 1400mm, other sizes available on request. For more information please see our downloadable E-Brochure below.